Just what in the World is Drinking Vinegar (AKA “SHRUB”)? Drinking vinegar originated in ancient Roman times as a pre-refrigeration manner of preserving seasonal produce (including vegetables, herbs and fruit). It had a resurgence as a popular drink in 17th and 18th century England where it was typically made with rum (or brandy), mixed with sugar and the juice or rinds of citrus fruit. Meanwhile, in the American colonies, a shrub was a drink made by mixing a vinegar syrup with spirits, water, or carbonated water. The vinegar was again used as an alternative to citrus juices in the preservation of berries and other fruits for the off-season and was also referred to as a shrub. By the 19th century, typical American recipes for shrubs used vinegar poured over fruit—traditionally berries—which was left to infuse anywhere from overnight up to several days. Afterward, the fruit would be strained out and the remaining liquid would be mixed with a sweetener such as sugar or honey and then reduced to make a syrup. The sweet-and-sour syrup could be mixed with either water or soda water and served as a soft drink, or it could be used as a mixer in cocktails. This drink was immensely popular and refreshing in a time when there was no such thing as a cold drink in the summer. Vinegary and other sour drinks are better at quenching thirst than anything else in hot weather as they stimulate salivation. During prohibition, it was a popular drink again as a liquor-free alternative to lemonade. Shrubs eventually fell out of popularity with the advent of home refrigeration and the burgeoning soda business. The serving of vinegar-based shrub drinks became popular again in 2011 in American restaurants and bars. The acidity of the shrub makes it well suited as an apéritif or used as an alternative to bitters in cocktails. The term “shrub”, in these modern times, is a sweetened vinegar-based syrup from which the cocktail is made; the syrup is also known as drinking vinegar. The fruity flavor and acidic bite of shrubs really plays well to produce non-alcoholic cocktails and mixed drinks. You can combine flavors as well, such as pairing apricot with rosemary or grapefruit and mint. Vegetables such as tomatoes or celery make surprisingly delicious shrubs. Experimenting with different types of vinegars can lead to an endless number of combinations. 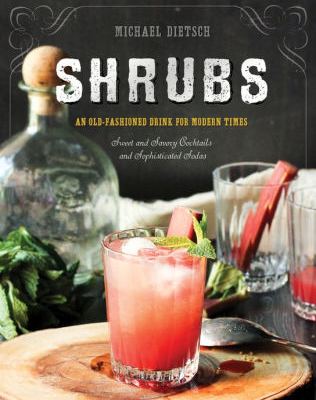 Here is a recipe for a fruit shrub from Michael Dietsch, the author of Shrubs – An Old Fashioned Drink for Modern Times. Mix apricots with sugar and mash together. Cover with plastic wrap and let sit in the refrigerator for 1 day. Strain through a fine mesh strainer to remove solids and combine the syrup with vinegar. Whisk until sugar is dissolved and then put in a mason jar and refrigerate for one week before using. How to use your apricot shrub? Mix it with ginger ale and add a splash of grenadine for a modern twist on a Shirley Temple or mix it with sherbet, soda water and a shot of rum for a grown-up float. https://www.bbbseed.com/wp-content/uploads/2019/01/BBB-Seed-logo-with-tagline.png 0 0 Engrid Winslow https://www.bbbseed.com/wp-content/uploads/2019/01/BBB-Seed-logo-with-tagline.png Engrid Winslow2019-02-05 05:00:152019-02-15 14:10:15Just what in the World is Drinking Vinegar (AKA “SHRUB”)?